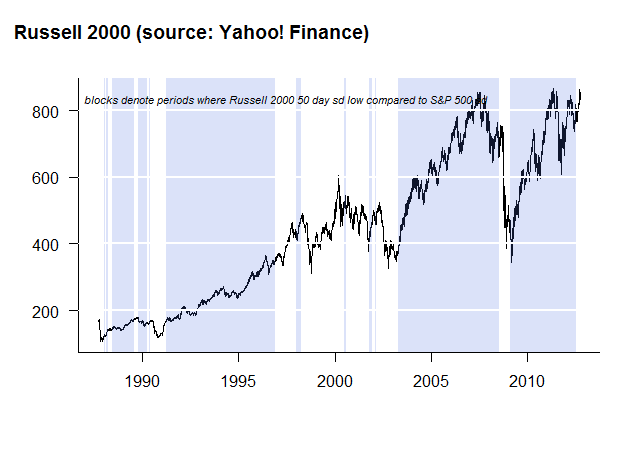 Continuing in my exploration of the Russell 2000 (Russell 2000 Softail Fat Boy), I thought I would try to approach the topic with a low volatility paradox mindset. Since 2005, beta of the Russell 2000 compared to the S&P 500 has exceeded 1.2 with a max of 1.6 for almost every rolling 1 year period. This suggests that the Russell 2000 is anything but low vol. However, we can take a more simplistic view by comparing the rolling 50-day standard deviation of the Russell 2000 with the S&P 500. Russell 2000 on an absolute and relative basis does very well when rolling 50-day standard deviation of the Russell 2000 minus the same standard deviation on the S&P 500 exceeds –1.25%, so the Russell 2000 performs best when volatility approaches the S&P 500. 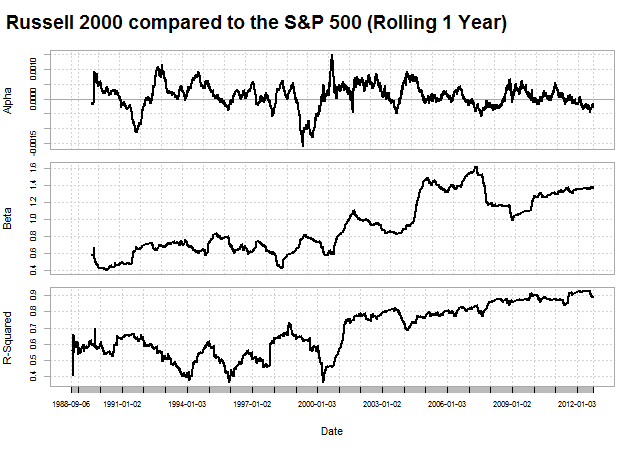 In low relative volatility environments, it seems we should own the high beta Russell 2000. You will see the largest down moves all occur in the non-shaded time periods. I intentionally wanted this post to be simple, so I hid a lot of the preliminary work and extra links. Far more went into this than appears above. Very interesting. Wonder how long it will continue. Thanks for the excellent work. COuld you explain how you calculate this in more detail? Do you substract the 50 day standard deviation of the $SPX from the 50 day Std. Dev of the $RUT? or do you do some ratio? Thanks. Very interesting - it seems as though this could be a new method to identify high and low risk regimes by vol differentials (and not by absolute vol)! As I started to generalize through testing on French data, I realized there are some potential issues with this methodology as the dataset gets long and relative strength moves persist, such as growth versus value since 1926. I found a paper that addresses some of this. I'll try to dig up the link to post in a comment soon, so readers can test and extend.